Many of you will have heard of the Secret Six but until a couple of years ago no such super-team existed. In fact, several members of it didn’t exist either, or at least not in their current guises. 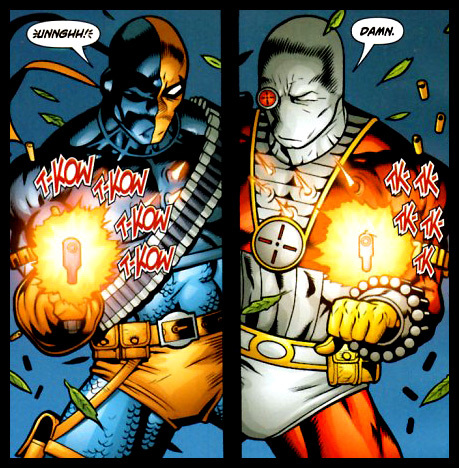 Catman, Rag Doll, Parademon and Scandal Savage are the more unknown characters who, along with Deadshot and Cheshire, make up the Secret Six. 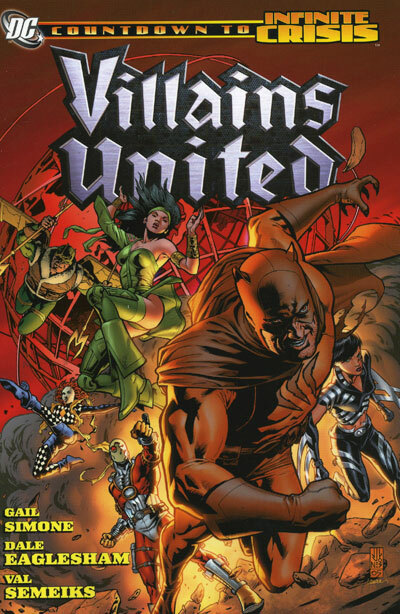 The miniseries itself was a direct tie-in with the 2005 DC Universe-changing title Infinite Crisis, one of 6 or so major tie-in/precursor titles for the event. Out of all these tie-ins, Villains United is one of the few tie-ins that can be enjoyed separately from the main story. This trade has more links to the previous mini-crisis, Identity Crisis, than most of the other tie-ins, which for me is pretty nice as I like books that don’t just forget what has happened. Following the fallout of Identity Crisis and the shock revelation of what the Justice League did to Dr. Light, the super-villain community is allying up to make themselves stronger against the so called heroes; they are forming “The Society“. We join them in the full swing of their recruitment drive which features some fan favourite villains starting off with Mr. Freeze and ending with Sabbac and Catman. They all swiftly say yes, in a similar fashion to LOTR’s “You have my sword” followed by “And my …” (replace … with axe/bow/freeze-ray). All except Catman that is. 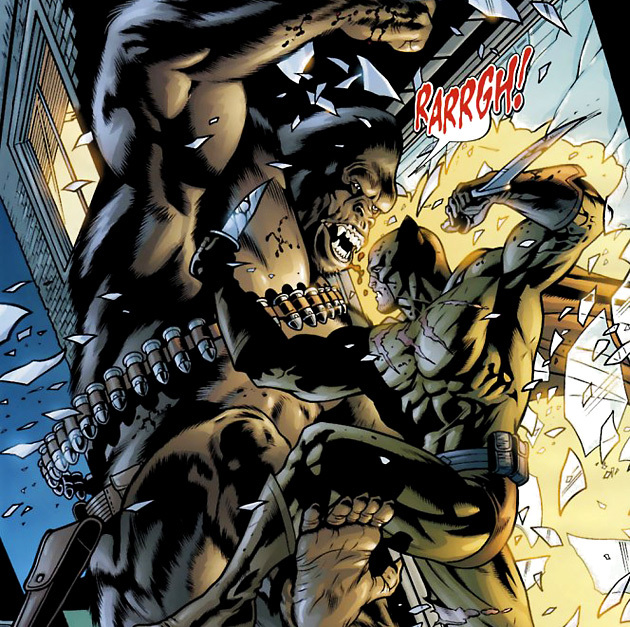 “No,” he sternly responds to Talia al Ghul and Dr. Psycho, which goes down like a lead balloon. Being turned down by Catman of all people does even more to infuriate the society’s “recruitment officers.” He isn’t even a B-list villain. With the Society wanting to become a major force to be reckoned with, this isn’t the kind of underground press they wanted. The majority of the Society want to kill Catman to make an example of him, but Luthor steps in, as devious as ever, suggesting that there is a better way to make an example out of him. The plot then skips to the other 5 members of the Secret Six, who are joined by the Fiddler out on a mission in the Amazon. It becomes apparent that they are acting as a force against the Society on behalf of some faceless employer, Mockingbird. During the course of this mission Fiddler [Spoiler: is tragically killed], meaning they are currently one member shy of being the Secret Six. Obviously they have to replace him. It would be bad juju to not have the right number of members for a phonetically pleasing team name. This is where Catman comes in. The plot then flows forward in a mostly linear fashion. It is not really a spoiler to find out that part of Luthor’s plans involved humiliating Blake by killing not just him but the entire Secret Six. So now we get to enjoy a full-on super-villain-on-super-villain (ultra-hyphenated) war. The writer for this series is Gail Simone, best known before this series for her work on the popular Birds of Prey ongoing. I am happy to report that her writing in this volume is of the same high standard I had come to expect from her previous work. In fact, this team shows off her ability to write characters from scratch that manage to hold my attention better than she ever did before. The Secret Six also allow her to show of the darker side of her humour more than ever, which is the central force behind my affection for this team. 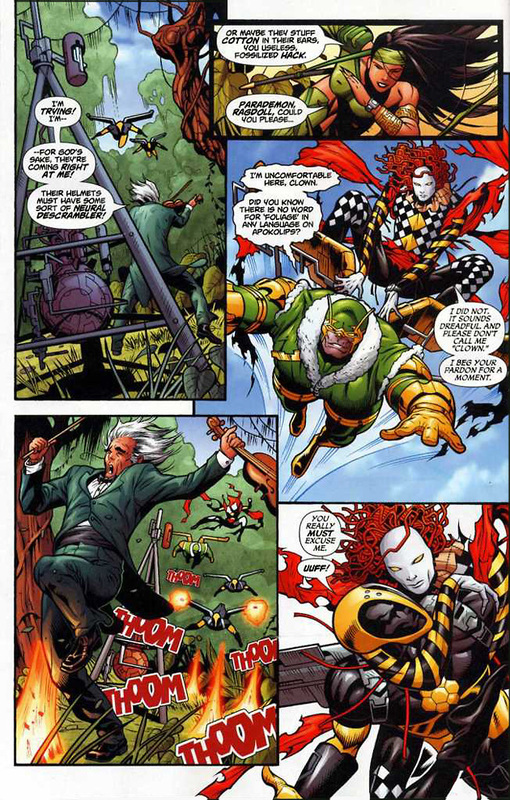 The interaction involving Rag Doll and Parademon is prime example of this, as is almost anything Rag Doll says. That Rag Doll is one sick character but you cannot help loving him. After all, he is so well spoken and so polite, even when someone has kneed him in the groin. One of the most fun things about this volume is how it spans the whole range of super-villains in the DCU. There are a ton of different characters popping up everywhere! So many, in fact, that there is a guide in the back that acts a visual role call of who was in the book (by my count, over 70 different villains!). The downside of the title being a tie-in is that some of the plot is aimed at having some affect on the Crisis, meaning sometimes the plot seems slightly unnatural. The artwork is primarily drawn by Dale Eaglesham (Green Lantern Volume 3) which is up to a decent standard. It isn’t artwork that you will wow you, but neither would you find it insulting to your retinas. As mentioned earlier, there is a whole array of different characters in this volume and I can imagine Dale had a great time getting to draw so many. As I am sure Val Semeiks (Lobo) did when he covered for Dale in issue 3. His pencils are a little bit better than the main artist’s. I would also like to point out another neat feature of this collected edition. The first few pages of the book compromise of a summary of events leading up to this trade, taken from all over the DCU. It acts as a very good introduction to the book and a check-in to make sure you know anything needed to enjoy the story. This is a feature I would like to see more in books featuring new teams. For example, something in the beginning of the new Batgirl could have had a brief run-down of Stephanie Brown’s life, Cassandra Cain’s career in the cowl, and the other main events in the Batverse that come up in the trade. Without it, the story might be a little hard to follow for new comic readers. I have attempted to keep this review relatively vague so as not to spoil anything from Identity Crisis or Infinite Crisis. These are two titles that I would 100% suggest reading before you stumble across a spoiler somewhere, if you haven’t already. 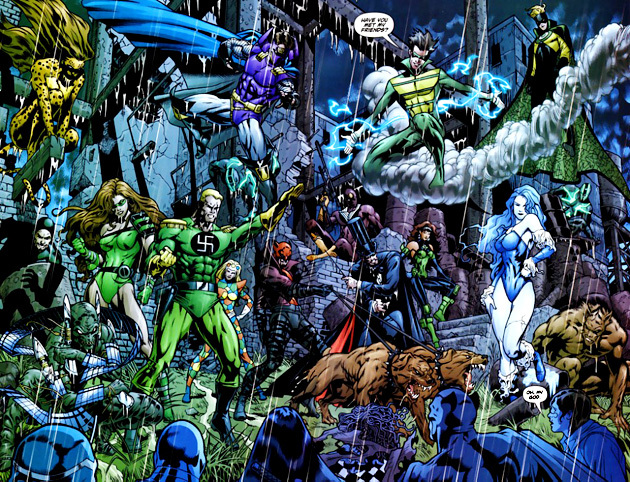 So what of Countdown To Infinite Crisis: Villains United? Do the new characters hold their own? Does the team fit together and work? Is there enough here that it deserves its own ongoing? Should that title be successful? Yes, yes, yes and hell yes. On the whole this is a very good book with only the average art and slightly forced links to Infinite Crisis letting it down. This is the start of one of the best additions to the DC Universe in a long time. Or let me put it this put it this way: out of 3 direct titles that came out of Infinite Crisis, Secret Six is the only one still going with no signs of stopping. And it all started here. A solid start to a new team that only grows stronger with each trade. The trade itself is what an example of how modern collections should be put together and adds thoroughly to the enjoyment factor. Not overly essential for Infinite Crisis. Small ties to Identity Crisis. Entirely essential for the Secret Six. Surprisingly, nothing is essential to read before hand. The collected edition has a rare and really useful 8 page segment at the beginning of the trade detailing everything you need to know. You would be missing out if you haven’t read the main Identity Crisis trade, however. I would say it would be wise to also read Countdown to Infinite Crisis: The OMAC Project if you intend to read this and the main Infinite Crisis collection. I would suggest reading the back up story featured in Infinite Crisis: Companion, and from there move onto the limited series collected in Secret Six: Six Degrees of Separation. Chris just posted a review of that book. After that, just follow along the Secret Six Trade Reading Order. And despite having utterly nothing to do with the DCU, I would heartily recommend Enid Blyton’s similarly named classic Secret Seven books. Wonderful review, Simon! I love having such detailed information on how these books fit into continuity, what characters are important, and so on. It’s a shame to hear you didn’t enjoy the art too much, but it definitely looks more than serviceable to me. Looking forward to hearing what you guys thought of Six Degrees. I’m glad you liked the review, although as soon as I submitted I regretted it, my general feeling from writing it was it was poorly written. Reading it through it wasn’t as bad as I had thought, thanks to your skilful editing too. It is one of those nice books that link a million things together, while this limited the plot a little it meant for some nice little links and cameos. without a doubt there is so much, very difficult to avoid spoilers. The one thing I liked was that I purposely worded the spoiler so it is as least spoiling as possible and humorous for those who have read the title already. I’ll start working on it when I get free time on wednesday and hopefully have it in to you by the end of the week depending on how many breakdowns I have and crying fits. Great review Simon, I loved this collection too – I wasn’t really digging the whole “Countdown to Infinite Crisis” schtick, but this one was a pleasant surprise! I mean it’s Catman! And he’s awesome! I’ve always thought there was a lot of potential for him as a kind of stubbled and nasty batman. I was so surprised at how much I enjoyed him and he’s totally on my list for characters to follow now. not bad for a throwaway villain concept. Catman has become an essentially Batman copy without the money and without many rules to follow, definitely a concept that makes for fun reading. Rag Doll is my favourite by a long way, he’s got sick things about him that are in the same league as stuff from “The Boys” but presented in a much more loveable form. I can’t wait to see what he does next, but he’s one sick dude. Here’s a question – is it Rag Doll or Ragdoll? Six Degrees seems to type it as one word. It looks like the majority of DC character lists and wikis have it as Rag Doll. we’ll leave it that way for now, I suppose. No real worry about it, just want to be consistent. yeah, haven’t had a chance to look at it yet, except to check that the form sent it correctly. Just finishing up the scans for Secret Six. No worries, just wanted to make sure my inbox wasn’t leaking emails; I see you’ve initiated d55, or should I say Chris D, into the Christian name group. That’s an interesting point, using the term Christian name has become the norm in UK and I’d imagine the same in the US. But if you have not been christened then surely not a Christian name really; does it mean I have friends who have Islamic/Jewish/atheist/agnostic names?